Get ready to tighten those faucets. Governor Jerry Brown signed a pair of bills into law on Thursday that create a framework for permanent statewide water efficiency standards, whether the state is in drought or not. “In preparation for the next drought and our changing environment, we must use our precious resources wisely. We have efficiency goals for energy and cars — and now we have them for water,” said Brown in a press release. 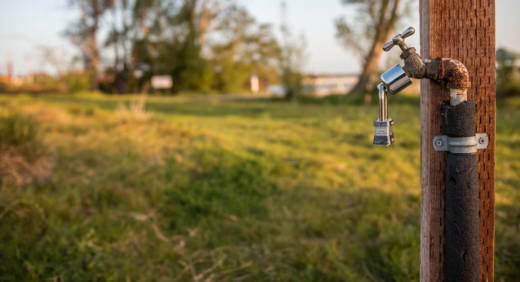 The new standards, which must be met by 2020, set limits on personal water use and require water providers to develop annual water budgets. The Mercury News reports that the new mandates are a response to pushback from water suppliers who complained about the strict standards enacted during the emergency drought period. The laws are a response to complaints from some water agencies that the mandatory water targets the Brown administration put in place during the drought were too inflexible and didn’t take into account local water supplies, population growth and other factors. Californians used an average of 90 gallons of indoor and outdoor water per day in 2017, down from 109 gallons in 2013, according to the State Water Board. Some environmentalists expressed disappointment with the new standards, writes Paul Rogers for the Mercury News. State regulators will conduct studies and consult with local districts to establish appropriate outdoor targets that take into account local needs, reports the Sacramento Bee. In 2014, Brown declared a state of emergency in response to the drought and the following year, temporary limits on water use were established. Those measures were lifted in 2016.